TVS Motor Company, a leading manufacturer of two-wheelers and three-wheelers in the world, today, unveiled its first 125cc scooter, TVS NTORQ 125 at a city hotel. Designed for the youth, TVS NTORQ 125 has been developed based on the TVS Racing pedigree and comes with the state-of-the-art CVTi-REVV 3 Valve engine. The scooter also marks the launch of an exclusive technology platform – TVS SmartXonnect* – making it India’s first connected scooter. 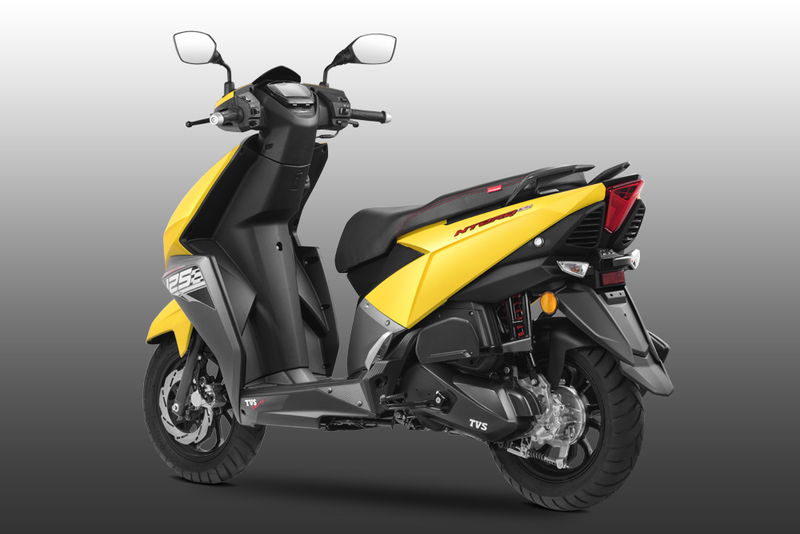 TVS NTORQ 125 is sporty, stylish, high performance and a technology loaded scooter. This scooter has been concpetualized, designed, developed and engineered for the youth. Apart from being a fantastic ride and overall automotive offering, it is also India’s 1st Bluetooth connected scooter. TVS NTORQ 125 has all it takes in form style, performance, features and technology to deliver customer delight to the youth of India. Taking a cue from the design of a stealth aircraft, TVS NTORQ 125 embodies a sharp, aggressive style with a signature tail and LED tail lamps. The well-placed sharp cuts of the scooter accentuate its appeal, lending it a tapering, sporty look. Equipped with a sporty stub muffler, an aggressive headlamp cluster and textured floor board, it has diamond cut alloy wheels which make a distinct style statement. 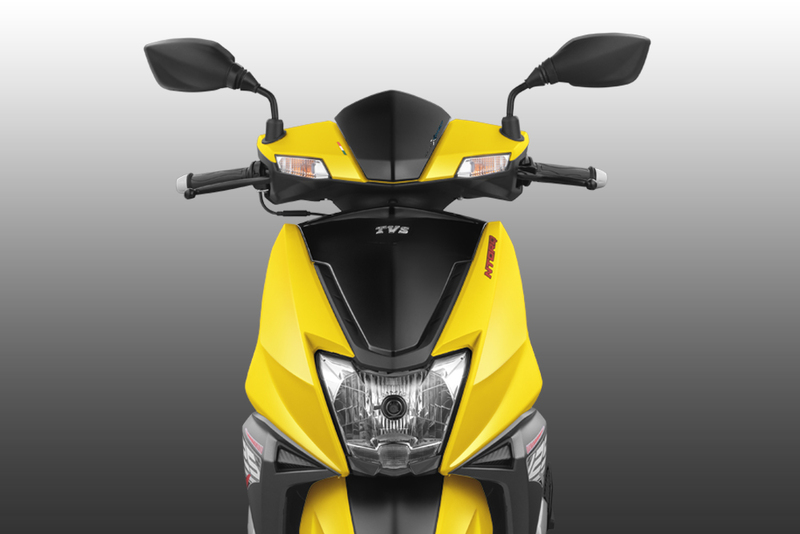 TVS NTORQ 125 boasts of superior performance backed by TVS Racing Pedigree. The TVS Racing scooter team holds a winning record in the Indian Scooter Racing Championships for the past 4 years. TVS NTORQ 125 gets the new generation CVTi-REVV 124.79cc, single-cylinder, 4-stroke, 3-valve, air-cooled SOHC engine that churns out 6.9kW@7500 rpm / 9.4 PS @7500 rpm and 10.5 Nm@5500 rpm. The additional valve in the engine accentuates the performance of the scooter which boasts of a top speed of 95 kmph and an excellent acceleration. TVS NTORQ 125 also has a unique exhaust note. TVS NTORQ 125 premieres the TVS SmartXonnect*, an innovative Bluetooth-enabled technology which is paired to an exclusive NTORQ mobile App which can be downloaded from google play store. TVS SmartXonnect* enables a host of first-in-segment additions to the fully digital speedometer, which boasts of 55 features including navigation assist, top speed recorder, in-built lap-timer, phone-battery strength display, last parked location assist, service reminder, trip meter and multi-ride statistic modes such as Street and Sport. The ergonomics of TVS NTORQ 125 is developed with supreme focus on comfort and convenience of the rider. The scooter gets wider 110x80x12 tubeless tyres along with telescopic suspension and least turning radius to facilitate travel across all kinds of terrains. Features such as pass by switch, dual side steering lock, parking brakes and engine kill switch are focused on creating a fulfilling ride experience. To facilitate convenience of use, TVS NTORQ 125 comes with external fuel fill, USB charger, large under-seat storage and TVS patented EZ center stand. The scooter is presently available in Disc variant to ensure maximum rider safety. 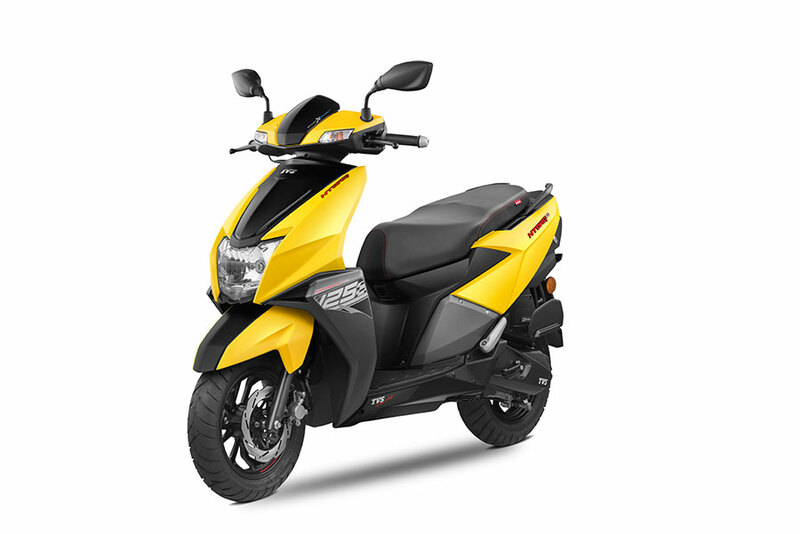 Equipped with unique Daytime Running Lamps (DRL), TVS NTORQ 125 is available in the colour selection of Matte Yellow, Matte Green, Matte Red and Matte White. It is loaded with 30 industry-first features. 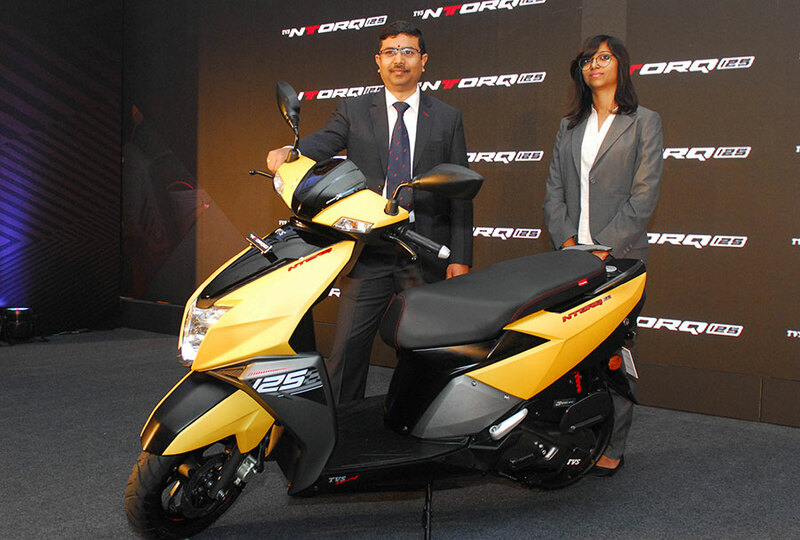 The TVS NTORQ 125 will be available at an attractive price of Rs. 61,450 (Ex-Showroom – Bangalore).